For Michael Luca, one role's never enough. Whether he's playing a character who plays another character in a play within a play or pulling double duty like his Lorenzo/Gobbo track in this show, Michael's a guy who likes his plate full. And are we always willing to accommodate. 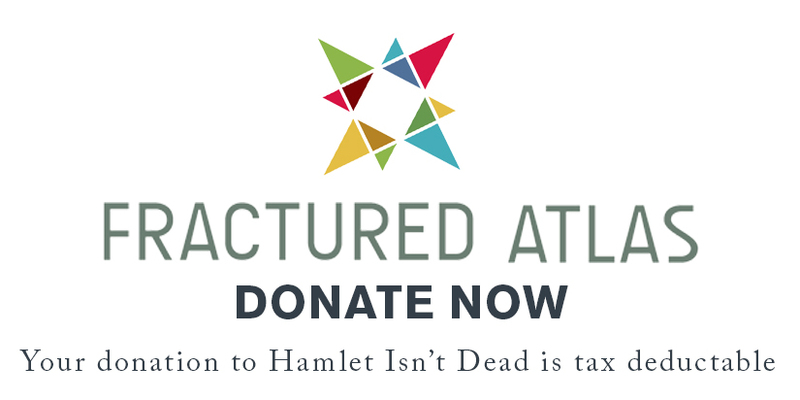 Don't miss the man of a thousand faces (and voices and talents and words) in Hamlet Isn't Dead's Merchant of Venice. And this is only Face #874. Impressed yet? HID: First thing’s first: What’s your favorite color, and the favorite color of each of your characters? And why? ML: My favorite color is purple because I think it’s rare to see and very pleasing to look at. Launcelot’s favorite color is gray because it lives happily between the two extremes of black and white: it is not forced to choose a side! Lorenzo’s favorite color is dark blue: it’s sensitive, yet trusty, and can pass under the radar if need be. HID: What do Lorenzo and Launcelot most have in common? What are their biggest differences? ML: Lorenzo and Launcelot share a belief that a greater lifestyle awaits them just beyond their doorstep if they would only take a chance to be adventurous. Fortunately for them both, they do take those adventurous steps, and end better than where they began because of it. Their biggest difference is that Lorenzo would have run away from Shylock first chance he got! And he wouldn’t have to think twice about it. HID: Who would win in a fight? Lorenzo, Launcelot, or The Wall? ML: Wellllll, Launcelot is a pacifist, so he wins by default. Lorenzo respects Launcelot too much to ever dare strike him (he is vital to Lorenzo and Jessica eloping). Wall, though, he is on the side of indiscriminate justice: he would mess up Launcelot and Lorenzo in no time if he had to. He would even separate them, restricting their communication to whispers—which they could only speak with his permission. HID: What’s been the most challenging part of this process for you? What’s been the easiest? ML: The most challenging part of this process has been constructing the “Fiend/Conscience” soliloquy with piano music. Speaking text while playing music has been one of the more difficult challenges I’ve ever had to perform onstage. The easiest part has been collaborating with the brilliant minds in the room. Every one of my fellow actors (and the creative team, too!) has had something nuanced and interesting to add to this beautiful show. Prepare to be impressed, as Michael Luca sing, dances, laughs, cries, & loves his way through Hamlet Isn't Dead's Merchant of Venice. You don't want to miss him (or the rest of the HIDiots) for this once-in-a-lifetime opportunity.